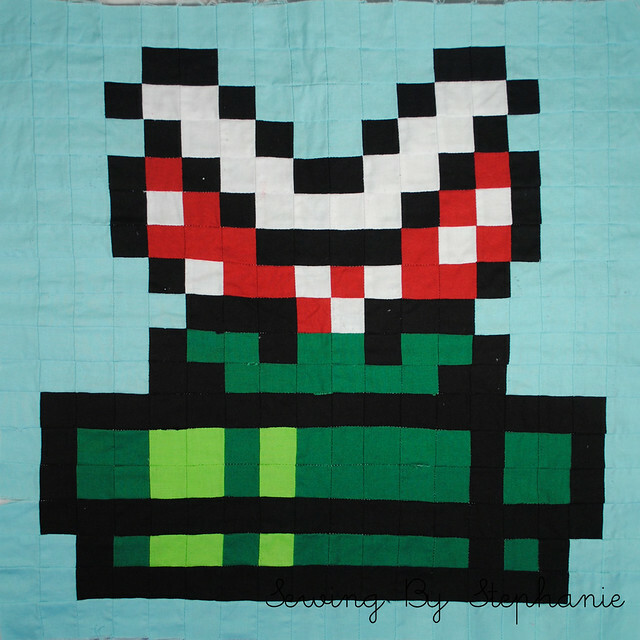 This is part of an ongoing series of posts for The Super Mario Brothers Quilt Along I’m hosting here on my blog. You can join in at any time! You will find the links to all steps in my top bar. 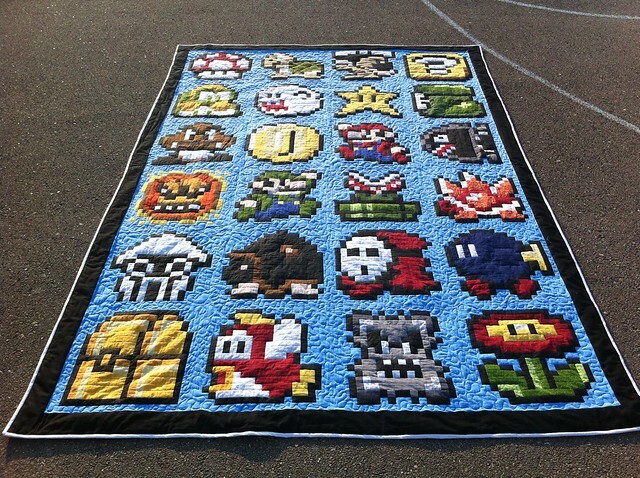 Also please feel free to join the Super Mario Brothers Quilt Along Flickr Group. Ready? It’s Green Pipe time! 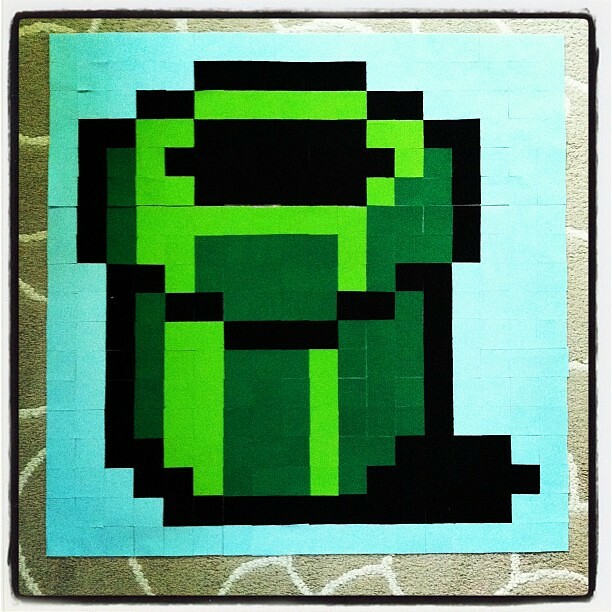 The green pipe…a staple again in the Mario Landscape. I remember using my Mario and Luigi and pressing that down button over each and every pipe because you never knew where it might take you. Some special pipes were a portal to the other worlds, underground or even the dreaded water world or (horrors) the sky world! But generally it was worth it to travel through the pipe to these other places for the riches you would gain. 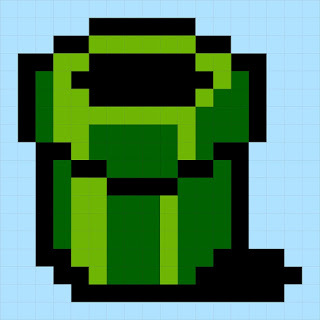 The green pipe was also a host for enemies though…creepily crawling from the pipe and dropping off the edge or just peaking their heads from the pipe in regular intervals trying to catch you off your guard. It’s Block #7 in our QAL and we are officially a decent way into the quilt. I’ll admit that I’m still working on sewing last week’s block and this week’s, but I think working on two at a time is a more efficient use of my time. That’s my story and I’m sticking to it. You can find all of the PDF’s for the Super Mario Brothers QAL available HERE. You can download the PDF of the Green Pipe Block HERE. If you are looking for other blocks from the quilt, look HERE. 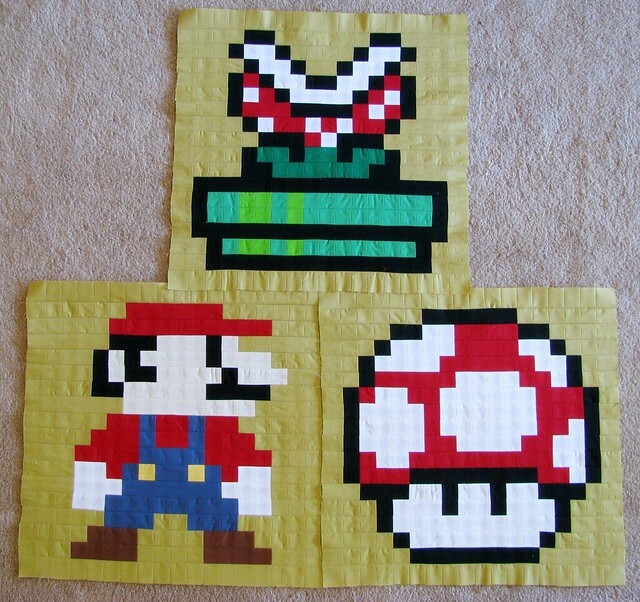 I kept the simple green pipe for the quilt, but I was HIGHLY tempted to switch over to the piranha plant with pipe block after seeing some pop up in the flickr group. They are fabulous! So take your pick. Be sure to add your creations to the flickr group so we can all see how we are doing! This QAL is amazing. I am not participating but I sure am amazed at all your creations and everyone else too. They all look great!!! Thanks for sharing! Wow, that finished one is amazing, and done so quickly too! I love these quilts my son and I plan to one day soon give it a try. I'm not doing the QAL (no time) but I'm really enjoying following along through your blog. Brings back so many memories of my son's first Nintendo and all the fun we had rescuing the princess. Thanks.